Double stitching design and with much more features, jacket is perfect all in all to be called it a very winsome costume for boys. This Lucas Till jacket has been taken from X-Men Apocalypse film which really gained fame very widely. With broad shoulders and simple shirt like collars, jacket can be served as shirt as well. Sometimes, if you don’t want to wear mandatory shirt, you might use it just like a shirt with closure of front zipper. Collars, zipper and shoulders are of bit different color which is light green. All these features have been characterized for glamorous appearance. 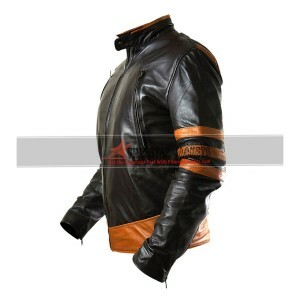 Jacket is composed of very high quality material. I do have the slim build but broad shoulders and this jacket is something that suits me the most as it seems it has been perfectly design according to my body physique. "Jacket has the button closure instead of zipper at front which makes me feel easy and rapid to take it on and wear off. "